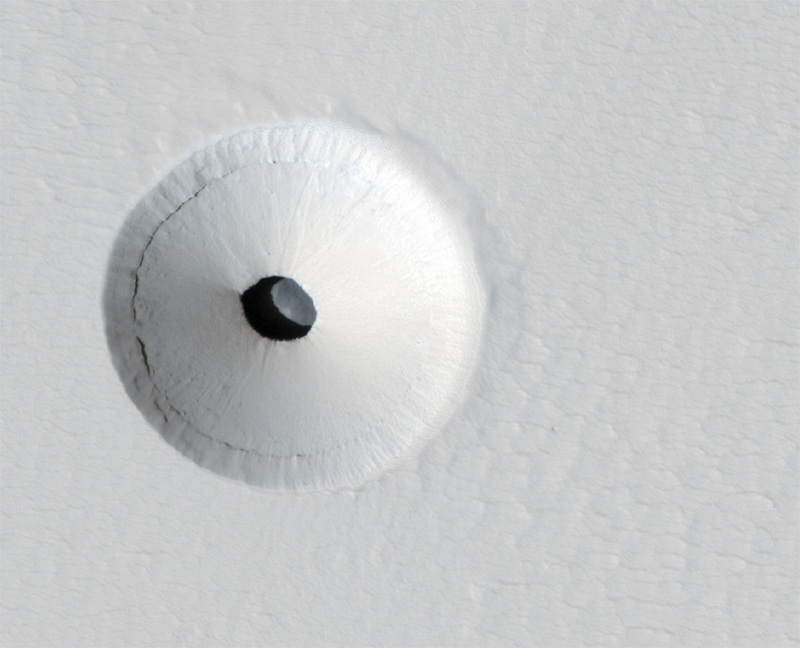 View of a skylight that opens into a Martian cave at the Pavonis Mons volcano, as photographed by the Mars Reconnaissance Orbiter (Credits: NASA). Recent discoveries of skylights and lava tubes on the surface of Mars and of the moon have initiated research and development of robots able to descend into caves and explore tunnels. Astrobotic Technology, Inc., a company founded by robotics researcher William Whittaker, is investigating how a robot would get itself into a cave. Three main options exist. Rappeling down from a skylight, like a mountain climber is the first one. It is a slow and controlled solution but could lead to issues if the cave walls were dry and made of powdery materials. Another option takes advanatage of Mars’ or the Moon’s reduced gravity by having the robot hop along the cave walls or directy lob itself down a hole. Finally, a third option is to string a suspension line across a skylight opening and have the robot lower itself down the center, thus avoiding the cave walls entirely. Exploring Martian underground could lead to the discovery of invisible sheltered treasures: potential habitats, shielded from the constant radiation that blasts the planet’s surface and protected from meteorite impacts and from day-night cycles that induce high temperature changes. In August 2012, Astrobotic Technology, Inc. was selected by NASA to receive a $500,000 grant for a two-year development program that would lead to the building of a cave-exploring robotic prototype. Whittaker himself is part of a Google Lunar X Prize team with whom he may present a scenario for a lunar caves exploration mission within three years.